IT consultants play a key role in the modern digital world. Without IT consultants to design networks, workout protocols and supervise the solution of problems, technology would never work as well as it's meant to. Barring some cataclysm, computers will continue to run in this world on into eternity, and as long as this is the case, an IT consultant will be necessary in many business situations. There are a number of situations that call the skill and expertise of an IT consultant. One such situation is a problem with computers, networking or other technology issues. IT consultants can locate the problem, and advise on solving and venting further instances of the problem. An IT consultant skilled in potential problems will be able to provide sound and experience, to prevent problems from arising in the first place. IT consultants also contribute to designing and maintaining various security protocols that make e-commerce and digital business a safe practice to conduct. Encryption systems, compression algorithm and highly secure infrastructures are all designed by skilled IT consultants. The need for IT professionals is never going to go away as long as there are computers. This is one of those career field that has quite a bit of job security and availability in nearly every economic climate. On top of this, IT consultants enjoy extra privileges which a regular, on-call IT technician would not. Consultants are somewhat freelance, aside from perhaps a consulting firm to which they answer. This means that an IT consultant gets to work with various companies in a multitude of fields, meaning that their careers all of variety. These top echelon IT professionals gets to tackle wide arrays of problems, rather than having to go back the same problem day in and day out, as regular technicians do. But, they're not going to hand the title of IT consultant to just anyone. First, one must acquire an IT consultant certification. What's the best way to take an IT consultant course, and get this IT consultant certification? Online certification is the best, most cost efficient channel to acquire an IT consultant certification. Online certification allows busy professionals to study on their own schedule, while still having plenty of time for their personal and professional obligations. It is also the most frugal route, eliminating tuition cost and most of the text book and class session costs. Brainmeasures is the world's best online certification provider. This is because we have a cutting-edge, inclusive technique for how our courses are designed. We have the highest rated professionals designing our courses, and they work closely with experts in the fields we teach. These experts work with our course design professionals to ensure that our courses are completely inclusive, and completely accurate. On top of this, our course design professionals draw on the experience put forth by these experts, so to imbue our students with a level of experience and prepared that no other online certification provider can match at any price. This certification consists of our IT consultant course, followed by an online exam. Upon passing the exam, a certificate is awarded to the student. 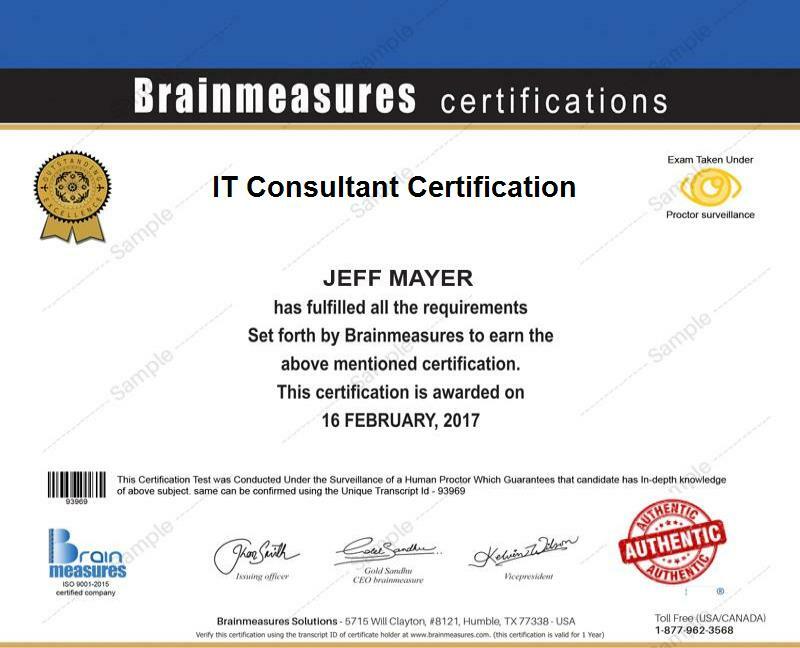 This certificate signifies a Brainmeasures IT consultant certification, the best of its kind in the field, as this is the best online training course of its kind. This field earns between $230,000-$690,000 a year with a good return, sometimes more for a successful IT consultant.